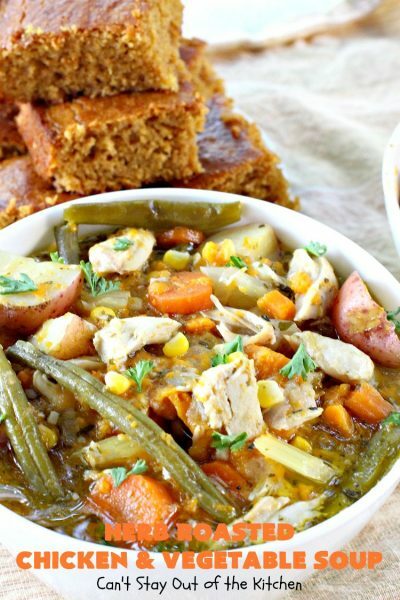 Herb Roasted Chicken and Vegetable Soup is mind-boggling in taste and deliciousness. I actually start this soup using leftovers from either my Roasted Chicken with Rosemary or Rosemary-Garlic Chicken with Sweet Potatoes and Green Beans. But I’ve included directions for you to make this from scratch in your crockpot if you don’t wish to use leftovers from either of those recipes. I’ve made it many times with varying vegetables and the taste is just awesome. I like to serve Herb Roasted Chicken and Vegetable Soup with homemade bread or cornbread. I made Molasses Cornbread to go along with it when I made this a couple of weeks ago. It’s a great dunker in soups, although this soup is so hearty and filling you probably don’t need bread as a side. 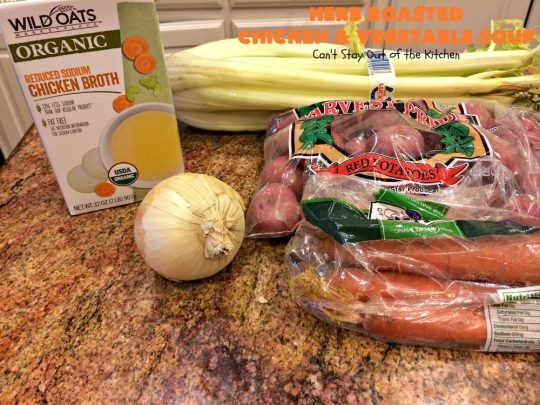 The garlic-rosemary-parsley butter is normally part of the the original chicken recipes so I added it to the soup in order to provide the full effect in the event that you just want to make the soup and not start out with the Roast Chicken dinner recipe first. It increases the flavor of the soup tremendously. 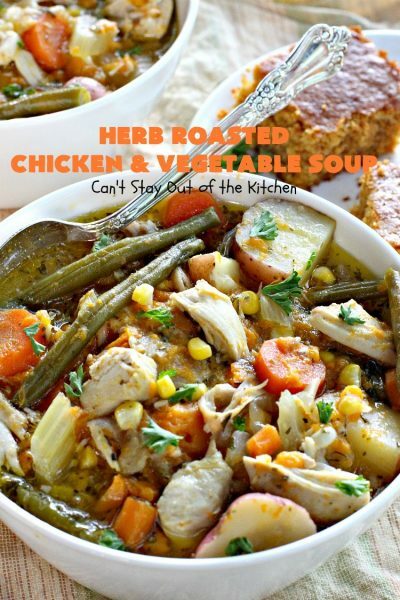 If’ you’re looking for a fabulous Chicken Soup recipe, then check out Herb Roasted Chicken and Vegetable Soup some time. 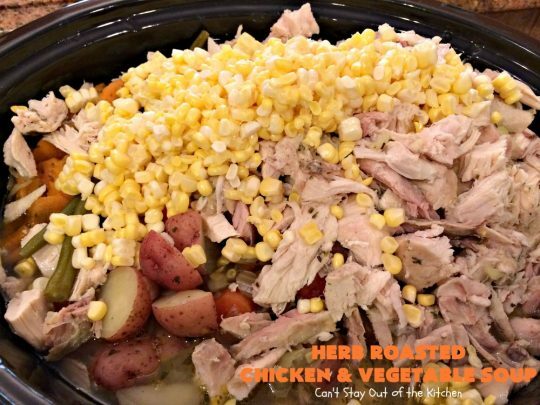 If you have a lot of cooked veggies from the chicken dinner, add them to the crockpot about a half hour before the rest of the meal is done so they don’t get over-cooked. You can also use leftover rotisserie chicken in this recipe. 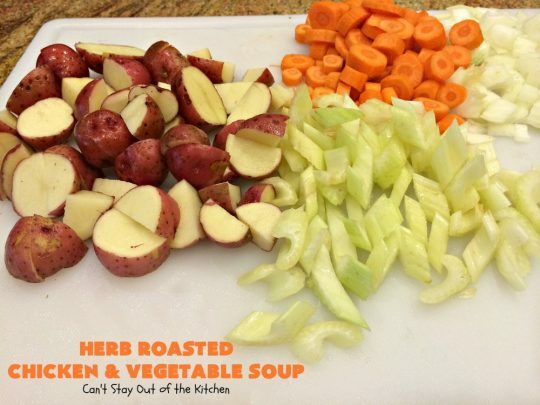 You can also add other leftover cooked veggies if you have them on hand. You will love the taste of this soup. I can’t recommend it highly enough. Plus, you can throw everything into the crockpot which is a a real time saver. 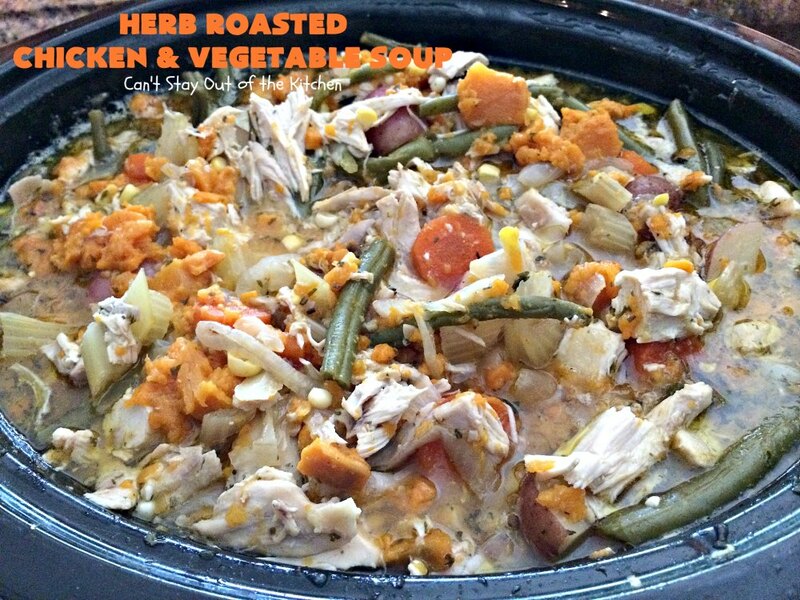 Herb Roasted Chicken and Vegetable Soup can be made from leftover Rosemary-Garlic Chicken with Sweet Potatoes and Green Beans or Roasted Chicken with Rosemary. But if you don’t have leftovers from either of those dishes, I’ve got directions for making this completely from scratch. The lovely flavors of garlic, parsley and rosemary permeate this awesome soup. 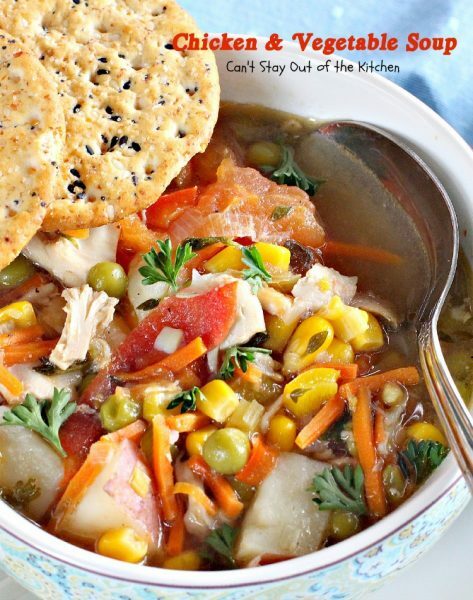 Herb Roasted Chicken and Vegetable Soup is one of the tastiest comfort foods you’ll ever eat. In addition to the leftovers from my Rosemary-Garlic Chicken with Sweet Potatoes and Green Beans I used these ingredients along with fresh corn on the cob. Pour chicken broth into crockpot. Add potatoes, carrots and celery. If you don’t have pre-cooked sweet potatoes, onions, or green beans, add them now as well. If you are not using leftover roast chicken from the aforementioned recipe, melt butter. Add parsley, rosemary, salt and pepper. Add that mixture to the crockpot now. Cook on high heat for 3 hours or until veggies are fork tender. 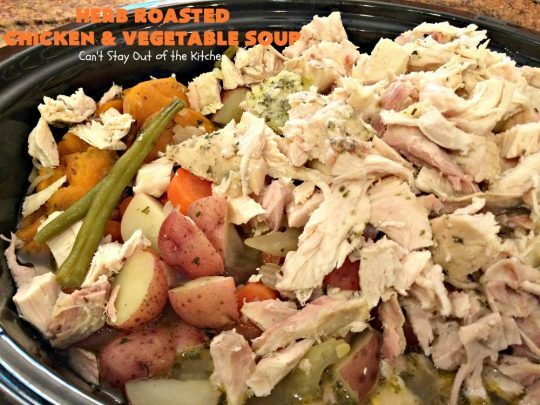 Once veggies are fork tender, add cut up cooked chicken, and any pre-cooked veggies (I added the sweet potatoes and green beans now). Add fresh corn from the cob. I added a little water. Cover with lid and heat through – about a half hour or so. Here the soup is ready. To serve: garnish soup with fresh parsley. Prepare yourself for a very hearty and filling soup. 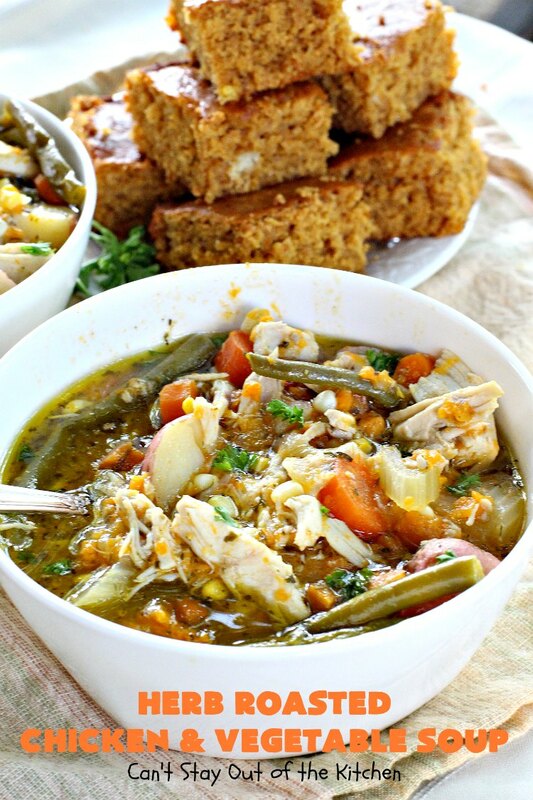 This delicious soup is chocked full of chicken and veggies in a wonderful parsley-garlic-rosemary broth. It's healthy, low calorie and gluten free. 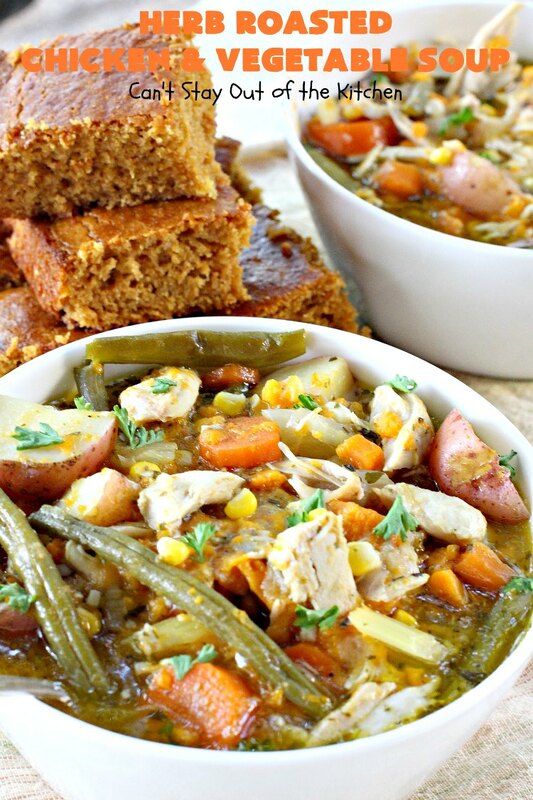 It's terrific comfort food for fall and winter nights. This hearty, filling and satisfying soup is so easy since it's made in the slow cooker. Debone chicken and refrigerate meat until ready to use. 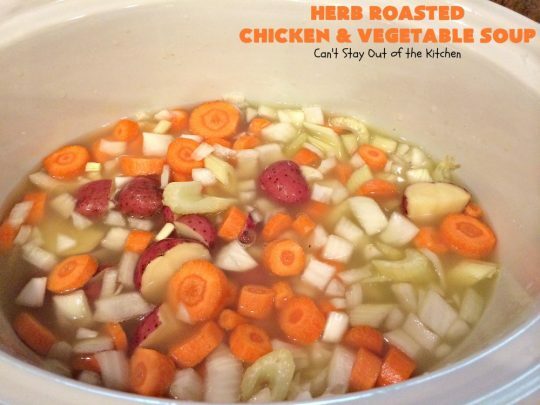 Pour chicken broth into crock pot. Add red potatoes, celery, onions, carrots, sweet potato and green beans. Combine butter, parsley, rosemary, salt and pepper. Add to mixture in crockpot. Cook on high 3 hours or until veggies are fork tender. Add chicken and corn and stir to combine. Heat an additional 30 minutes until hot. To serve: ladle soup into bowls. NOTE: If any of your veggies are already pre-cooked because you are using leftovers, add them in the last half hour of cooking time. NOTE: If you are using leftovers from Roasted Chicken with Rosemary, pour in all the broth from the garlic sauce and eliminate the extra butter, parsley, rosemary, salt and pepper, that I’ve added here. 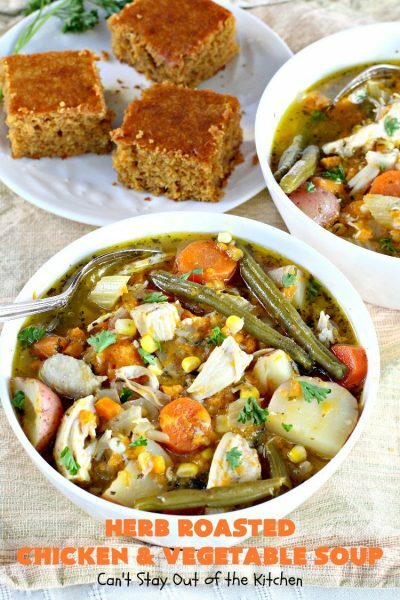 This delicious soup is chocked full of chicken and veggies in a wonderful parsley-garlic-rosemary broth. It’s healthy, low calorie and gluten free. If any of your veggies are already pre-cooked because you are using leftovers, add them in the last half hour of cooking time. 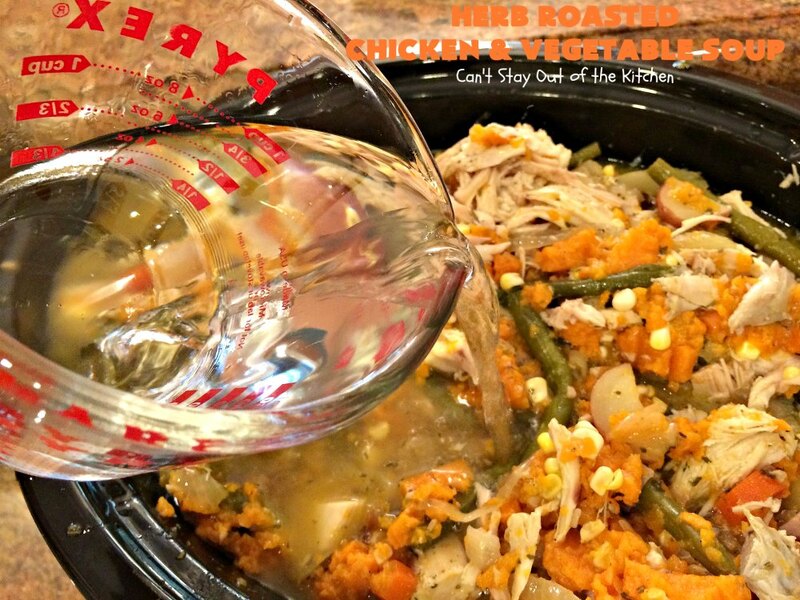 [br][br]If you are using leftovers from [url href=”http://cantstayoutofthekitchen.com/2012/06/23/roasted-chicken-with-rosemary/” target=”_blank” title=”roasted chicken with rosemary”]Roasted Chicken with Rosemary[/url], pour in all the broth from the garlic sauce and eliminate the extra butter, parsley, rosemary, salt and pepper, that I’ve added here. Herb Roasted Chicken and Vegetable Soup is a great recipe for cool winter nights. It’s healthy, low calorie, and gluten free. Have a side of Molasses Cornbread while you’re at it. It’s wonderful. Hello! This soup looks amazing but I am wondering what it would be like without the butter (or even with half of the butter! )…has anyone tried this?? 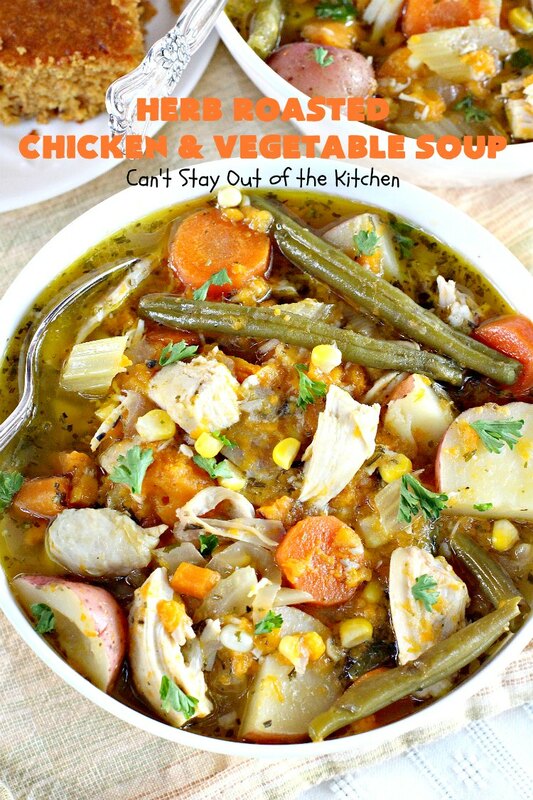 Oooo this looks like a wonderful hearty soup to warm up to this winter! It is wonderful, Julie. Thanks for stopping by. Wow! this looks perfect for right now– trying to eat a bit healthier in the middles of some falls travels an all the holidays coming up. I love the idea of the sweet potatoes with the chicken! thanks Teresa! I think you’ll enjoy this one Rhonda. We just love the flavors. This soup looks beyond comforting! Jocelyn, it is comfort food extraordinaire! 🙂 We love the flavors of this soup. Thanks so much for stopping by. I cannot get any of your recipes to print It doesn’t matter how I try Any suggestions? I’m so sorry, Kathy, I’m sure that’s frustrating. If you look at the top and bottom of each recipe there’s a green icon next to the other share icons. It says “other” options. If you open that icon, there’s a print friendly icon. That may work for you. The only other sure thing I know to do is to copy and paste the recipe into your own word document. I hope this helps.